My husband and I met on eHarmony. We quickly decided a face-to-face meeting needed to happen. First we met for coffee…after chatting for an hour when it was clear we were hitting it off, we decided food was in store. We found a delicious Middle Eastern restaurant. As I sat outside and listened to him chatter (he naturally talks a lot…but especially when he’s nervous), we enjoyed a sampler platter with all sorts of delicious food. I wasn’t sure what all the food was that day at the Middle Eastern restaurant, but it was all good. This green herb tahini sauce makes me think of that first date. Happy memories. What is tahini and what do you do with it? Tahini is a paste you can find at most grocery stores made up of ground sesame seeds. It’s also used in hummus (yum!). 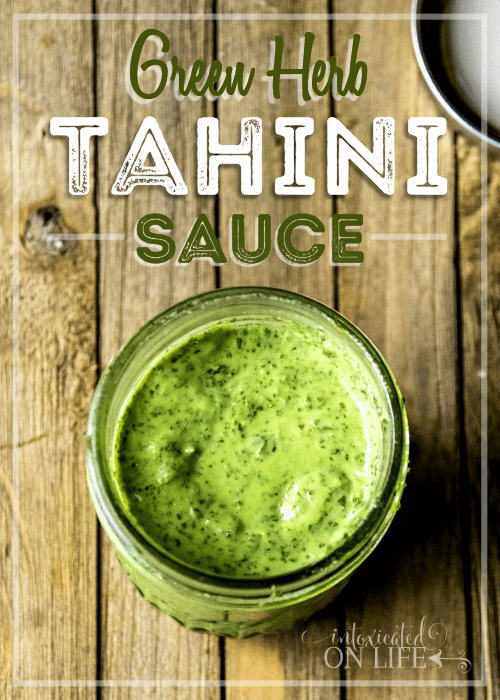 You can make a sauce out of the tahini that can be used on all sorts of foods. 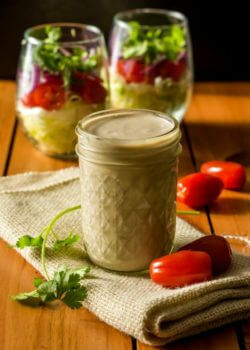 Tahini sauce often accompanies many different Middle Eastern dishes like babaganoush, falafel, and kabobs. But we also like drizzling it on some of other American standbys to give them a little extra flavor—cauliflower, burgers, and grilled chicken all taste a little better with this sauce! And be on the look out in a couple days for a grain-free carrot falafel recipe from me. Green herb tahini and grain-free carrot falafel is definitely a match! You’ve got some options with this recipe. This recipe calls for either cilantro or parsley, but you can really substitute any herb you’d like. Dill is a fun twist on this recipe, and gives quite a distinctive flavor! I’ve been on a cilantro kick lately because…well, because I love cilantro. But it’s not just the flavor I love, I also love it because it’s a great herb to help your body detox heavy metals. But I know cilantro is also a very divisive herb—it seems like you either love it or hate! There’s just no in between. So if you’re one of those cilantro haters, remember you have options. If you’ve never had tahini, it’s also important to note that it has a slight bitter aftertaste. To balance that bitter taste, you’ll want to add just a touch of something sweet. It could be maple syrup, honey, or my preference is stevia to keep it sugar-free. 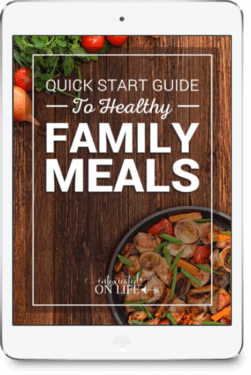 I use a pure stevia extract—just a teeny tiny amount because a little goes a long way! 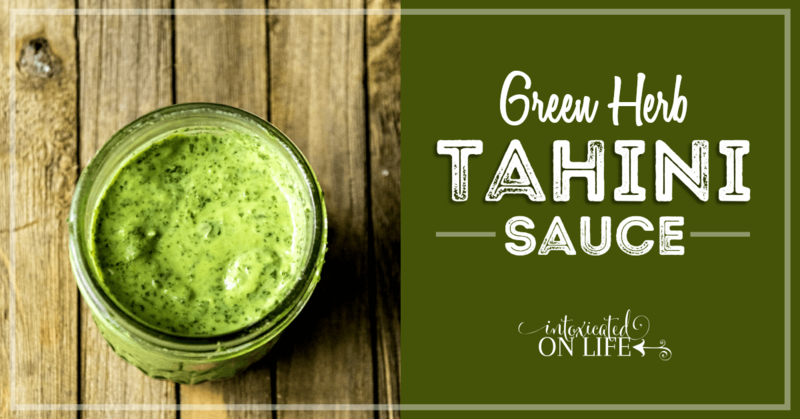 Who’s ready to make some green herb tahini sauce? Let’s get this party started! In a blender, add the cilantro or parsley, tahini, extra virgin olive oil, maple syrup, salt, lemon juice and blend until combined. 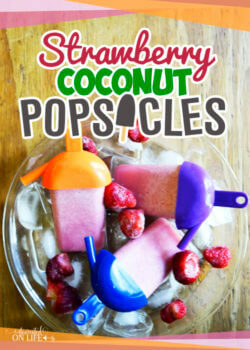 If too thick, add a tablespoon of water at a time and blend until smooth and reaches the desired consistency. Did you make this sauce? Be sure to let me know what you’re using your tahini sauce on! 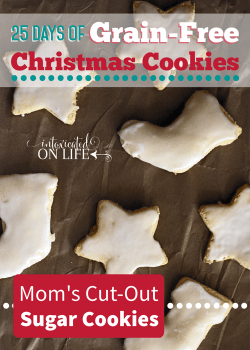 Sharing at The Modest Mom Blog, Saving 4 Six, and Pam’s Party & Practical Tips.